If you are not a professional woodworker and you rarely need a table saw, Rockwell RK7240.1 is one of the basic and affordable products that is suitable for hobbyists and doesn’t cost a fortune. Depends on available discounts, but you can get a brand new one delivered right into your doorstep for less than $200 and that makes it one of the most affordable products in this area. It’s not the most advanced saw on the market, but it is surely one of the best in this price range. The table top is 10” with legs. Weight is less than 35lbs. The blade attached has an adjustable depth and bevels from 0-45 degrees. It is easily portable because of light weight and easy transportable from one place to another. It is stable because of its aluminum table top. To use large stock pieces in less amount of time, Rockwell RK7240.1 there is a quick lock rip fence. To make vac attachment easy, the product comes with integrated dust collection port. It is easy to set it and use it anywhere. It has a safety on/off switch to ensure operator security and stability as well. The sturdy leg stand which is made up of metal is very easy to assemble. A table saw is basically used for woodcutting and Rockwell RK7240.1 13 Amp 10-Inch Table Saw with Stand can really be helpful at the work places. The best part of this product is that it can be transported easily to any place and at any time. The Rockwell RK7240.1 can cut up to 3 inches at a 90 degree angle and about 2 and a half inches at a 45 degree angle. If you order the product, you will get a rip fence, blade wrench, push stick and milter gauge along with this. The powerful motor is really helpful and lets you do the work properly and without wasting time. The Rockwell RK7240.1 really works perfectly on the pine and heavier wood items. It is totally adequate for non precision tasks. Home repairs and all other small works can be easily done with this product. It is really a wonderful machine that can do wonders with your wooden items. The fine tools that you get with this are also smooth in working and make the tasks easier for the worker. You can order the Rockwell RK7240.1 13 Amp 10-Inch Table Saw with Stand over the internet. They even offer the product at discounted rates. It works smoothly on the pine. Can cut up to 3 inches of wood. It weighs really less, so it is comfortable to transport. There is a powerful motor which helps in smooth work flow. These are some of the positive aspects of the Rockwell RK7240.1 13 Amp 10-Inch Table Saw with Stand and they would surely temp you to buy it. The zero clearance blade plate is not present in this product. The plastic, which used is cheap and is low in quality. There are some problems witnessed in the product when working with heavy wood. The blade height is a disappointment because it is really small. These negative traits of the product make it difficult for the users to use it comfortably. 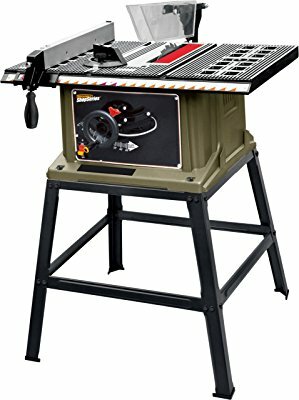 Overall, Rockwell RK7240.1 13 Amp 10-Inches Table Saw with Stand is a nice product and you can buy it to fix the wooden items at home and office.